Left-wing groups have also called for a protest on the day of his visit, leading organisers at Keren Hayesod's annual dinner to cancel Mr Bush's participation on security grounds. The New York-based Human Rights Watch and International Federation of Human Rights (FIDH) said the cancellation was linked to growing moves told him accountable for the use of torture, including waterboarding. He had admitted in his memoirs and TV interviews to ordering the use of the interrogation technique which simulates drowning. The action in Switzerland showed Mr Bush had reason to fear legal complaints against him if he travelled to countries that have ratified an international treaty banning torture, he said. Mr Brody is a U.S.-trained lawyer who specialises in pursuing war crimes, including Chile's late dictator Augusto Pinochet and Chad's ousted president Hissene Habre. Habre has been charged by Belgium with crimes against humanity and torture and is currently exiled in Senegal. He said: 'President Bush has admitted ordering waterboarding which everyone considers to be a form of torture under international law. Swiss judicial officials have said that the former president would still enjoy a certain diplomatic immunity as a former head of state. Dominique Baettig, a member of the Swiss parliament from the People's Party, wrote to the Swiss federal government last week calling for his arrest if he came to the neutral country. 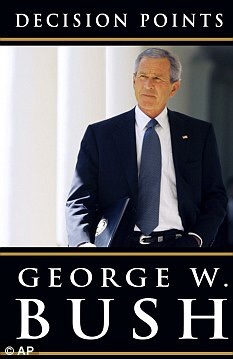 In his 'Decision Points' memoirs, Mr Bush strongly defended the use of waterboarding as key to preventing a repeat of the September 11 attacks on the U.S. Most human rights experts consider the practice a form of torture, banned by the Convention on Torture. Switzerland and the U.S. are among 147 countries that have ratified the 1987 treaty.